Fearless love is the key to realizing heaven on earth, teaches Gary Renard. Why? Because fearless love allows you to fully experience who you really are and rediscover your connection with the divine. Now, this bestselling author and contemporary teacher of A Course in Miracles (Foundation for Inner Peace, 2007) offers Fearless Love, a practical audio program to help listeners remember what it's like to be God or love itself. This insightful two-CD programcomplete with guided meditations and visualizations available nowhere elseteaches how to: Shift your mind's subconscious projector from seeing your reality as the effect instead of the cause Turn any human existence challenge into an opprotunity for deeper communion with the divine through fearless love Amplify the power of love and forgiveness to melt away worry, fear, and guilt Live a life where suffering is impossible, love is everywhere, and truth is all there is Jesus, Buddha, and other wisdom masters understood how to love unconditionallyand reminded us that this is in fact our natural state of being. 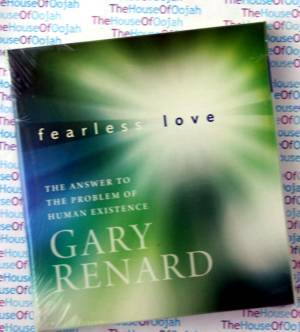 In Fearless Love, Gary Renard invites listeners to courageously unlearn the habits of the ego and experience life like the great spiritual mastersin eternal harmony with all of humanity and God. Gary Renard, the best-selling author of "The Disappearance of the Universe" and "Your Immortal Reality, was born on the historic North Shore of Massachusetts. He became a successful professional guitar player, but during the harmonic convergence of 1987, he heard a Calling and began to take his life in a different direction.At the beginning of the 1990's, Gary Renard moved to Maine, where he underwent a powerful spiritual awakening. As instructed, Gary Renard slowly and carefully wrote Disappearance over a period of nine years. In the fall of 2003, after much encouragement from other speakers and students, Gary Renard began to present talks and workshops in public. His speaking career took off remarkably fast, and today he lectures internationally. Combining a disarming sense of humor with radical, cutting-edge metaphysical information and experiential exercises, Gary has been described as one of the most interesting and courageous spiritual speakers in the world. Gary renard has spoken in 40 states, Canada, Australia, England and Costa Rica; and was the keynote speaker at the International A Course in Miracles Conferences in Salt Lake City and San Francisco. The Power of Now has been widely recognized as one of the most influential spiritual books of our time. Once you�ve experienced the power of the present moment, what�s next?